An important advantage of playing online is the fact that you are not stuck to a single game. This means that you can either experience two different games at a time or join multiple tables. While it is acceptable to play roulette and slots at the same time, it is never a good idea to do the same thing with poker. This is a game that requires a higher level of concentration. Furthermore, it is impossible to analyze the moves of your opponents if you switch from a table to another. As a result, there are higher chances to lose rather than win. 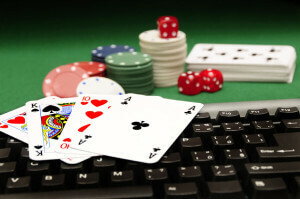 When you gamble from home, you have access to everything you need, like TV, telephone, or the Internet. These can turn out to be some pretty big distractions because instead of focusing solely on the game, you will feel tempted to do something else. The situation is different in a brick and mortar casino because there you can pay attention to the game and keep your eyes on other players. In order to create the perfect environment, it is advisable to choose a room with no TV and put your telephone on silent. Of course, you need the Internet connection, but you will have to restrain yourself from browsing search engines. When you have a laptop and can play from home you feel tempted to sit on the couch and enjoy the game. Even though this sounds really comfortable, it does not mean that it is a good idea. When you play at the desk, you tend to approach a professional attitude. Furthermore, you cannot spend too much time online, thus you are not prone to take poor decisions. Time management is also vital, and it is easier to keep a playing and relaxation balance when you differentiate the two of them. To be more exact, the desk needs to be for working and playing for real money, while the couch for having fun and chilling. Remember these four vital rules and you will definitely get the most of the best poker games that are available online!